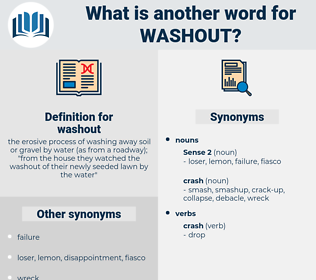 What is another word for washout? 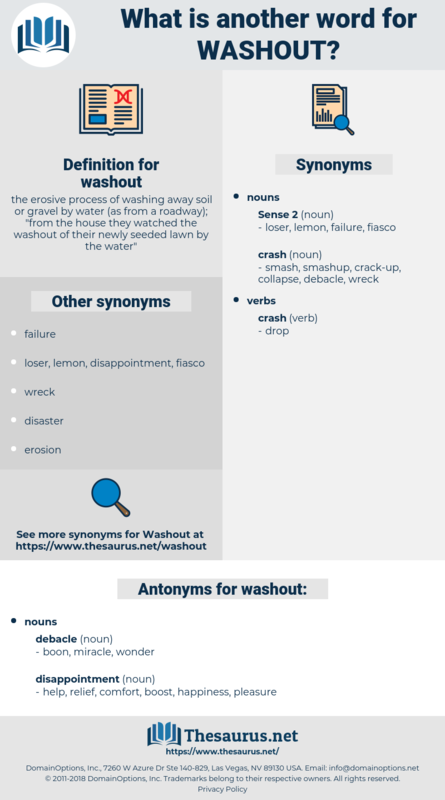 the erosive process of washing away soil or gravel by water ( as from a roadway); " from the house they watched the washout of their newly seeded lawn by the water"
washing, rinse, rinsing, fiasco, Handwashing, scrubber, laundry. help, relief, comfort, boost, happiness, pleasure. good fortune, blessing, good luck, win, prosperity. achievement, merit, achiever, accomplishment, attainment, earnings, gain. crackerjack, corker, dandy, jim-dandy, phenomenon.